This was in my CSA newsletter a few weeks ago, and is very worth sharing. I’m sure I’ll make a vegetarian version sometime soon, although the sausage was so, so tasty… Not great timing perhaps, as we just learned (or perhaps were only reminded) that red and processed meats cause cancer. Not a huge surprise. Of course the meat industry says not to discriminate and that meat is an important part of a balanced diet, which although not untrue isn’t a great defense for not cutting down on meat consumption (reading through the double negatives: lobbyists are biased and eat less meat). You can do that after you’ve made this. I would guess that a pig you could’ve met has less carcinogenic potential than something raised in a factory. At least you can buy organic meat. Old news by now but did you hear about how Bhutan, that tiny Asian country somewhere between India and China, aims to be 100% organic by 2020? Quite a feat, although perhaps less difficult without an entrenched industrial agricultural complex as we have here—even our version of organic has been co-opted. Similar to Maine, Bhutan has small pockets of viable land tucked into mountains and hills, which makes organic and permaculture more cost efficient. Maybe we should start measuring gross domestic happiness too, and we’d get there sooner. Instead, we live in a country where the idea that diet and the sustainability of the planet are related is too much for us, according to the recent dietary guidelines. Michael Pollan and co have exactly the right idea, we need a national food policy, and as Mark Bittman adds, it would help if we encouraged our political candidates to talk about food. It seems like a no-brainer: food and agriculture in particular has the ability to transcend political boundaries, uniting staunch conservatives and hippie young democrats. I imagine any issue with that much potential voter power to be tantalizing to politicians. But, finding ways for people to work together across party lines is not exactly our current political spirit. My other great political theory at this point in life is that if we fed everyone delicious food all the time (which is not something that everyone has access to, but that’s a story for another time), they’d be in a more convivial and collaborative spirit. Cooking provides a handy metaphor, by combining various ingredients into something new and more fulfilling than the separate ingredients alone. Here, the sweetness of the squash plays very nicely with the fatty sausage, a little vegetable oomph from the kale, texture from the grain…and salty creaminess is what cheese does best. I would’ve made this wth rice but ran out, so ended up cooking barley instead, and loved the texture. Use whatever grain suits your fancy, or endures your pantry. Cook the rice/grain, if you haven’t already, and chop the onion, garlic, kale. Preheat oven to 400ºF. Wash squash, cut in half lengthwise, and scoop out the seeds and guts. Place faceup in a pan or a rimmed baking sheet and add a little water. Start to bake while you prep the other ingredients. Heat up a pan over medium-high, and brown then cook sausage through. Remove from pan, leaving the drippings, and chop up as fine as desired, or remove from casing. Add onions and garlic to pan and start to cook until slightly translucent, then add kale. When cooked, mix in rice, sausage, and salt and pepper to taste (make sure to taste. You may have extra filling, I doubt it’ll present a huge challenge). 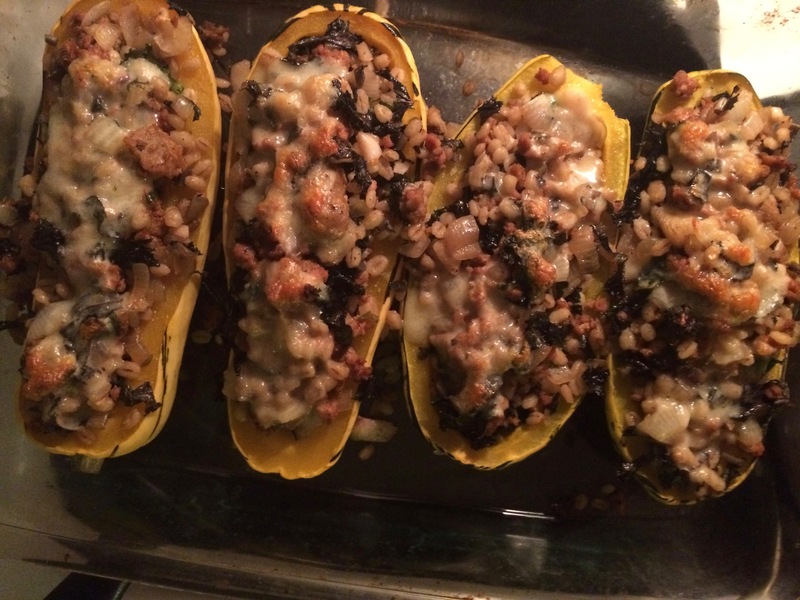 When squash is soft (easily punctured with fork, 20-30 min), remove from oven and fill with stuffing mixture. Sprinkle with cheese and place back in oven, under the broiler if you want it crispy, until cheese is melted. Remove, serve, and stuff your face. Sometimes you need a good, hearty chili, heavy on the beans. To mix it up from classic tomato-based chili, add squash and kale, and extra garlic (we all know by now that squash and kale go super well together. I put them on pizza, flatbread, in pasta, and evidently in chili). Great with a nice chunk of cornbread on the side (hopefully made with local cornmeal). I admittedly made this a few months ago when I had a few more fresh vegetables. But still manageable now, if you’ve got kale left, or soon when the farms have it again (the trouble with growing vegetables this time of year is the light, or lack thereof). Basis for the recipe from Goop (the link keeps changing for some reason so if it doesn’t work and you’re dying to look at it, google “black bean squash chili goop”). Soak the beans overnight, or the morning before cooking them. I also roasted the squash a little bit first—it gives it more flavor, and makes it easier to chop up; but this is pretty flexible. You can either roast it in halves first, until pretty soft, and then scoop out and chop up and add it at the end; peel and chop before roasting (good for flavor but kind of a huge pain) and add at the end (or don’t even roast, and just boil with the beans); or a mix—roast it part way, enough to make it easier to peel, and then either roast the rest of the way or throw in the chili earlier. I did the last, which seemed easiest. Chop or mince all the veggies. Heat up your pan with the spices (not salt) and toast them for 30-ish seconds until fragrant (this is the secret to getting the most out of your spices). Then add the oil and sauté for a few minutes, until the veggies are getting soft. Add the beans, and stock (or water), and cook for a while, until beans are starting to get soft. Depending on how much you are pre-cooking the squash, add them at some point (the squash takes about as long to cook as the beans). 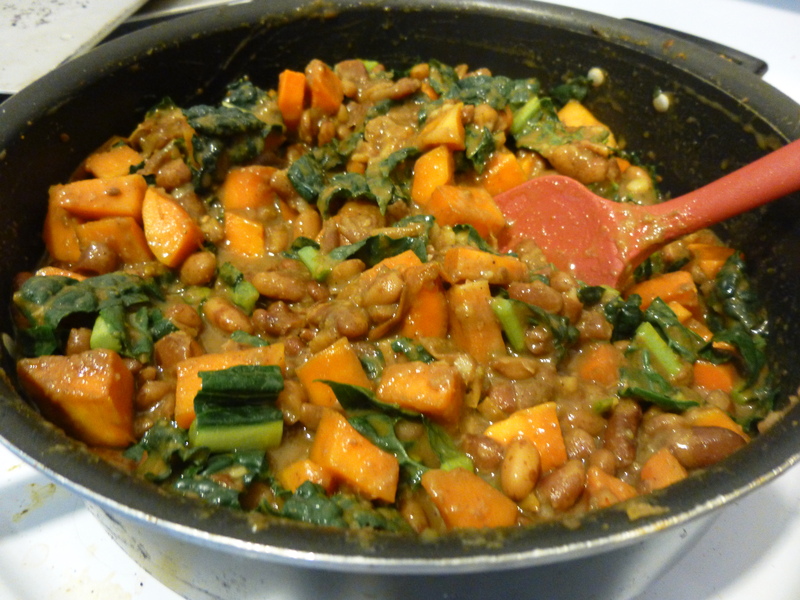 When both beans and squash are mixed together and basically cooked, add the salt, pepper, and chopped kale pieces. Cook the chili with the kale for a few minutes (it will soften up), taste and adjust seasonings, then serve. If you have cilantro, sour cream, or a little cheese, little garnishes are an excellent supplement to any chili. Enjoy!